About — Hanford Music Co.
HANFORD MUSIC CO. IS THE INSTRUMENTAL MUSIC PROGRAM AT HANFORD HIGH SCHOOL IN RICHLAND, WASHINGTON. THE HANFORD MUSIC CO. IS DEDICATED TO OFFERING WORLD-CLASS EXPERIENCES FOR ALL STUDENTS WITH A DESIRE TO MAKE MUSIC. Russ Newbury is currently serving as the Director of Bands at Hanford High School where he conducts three concert bands, one of four HHS jazz ensembles, teaches guitar class, and heads up the marching band. Russ Newbury is also active as the Conductor of the Columbia Basin Concert Band, a part of the Music Department at Columbia Basin College. Prior to teaching at Hanford, Russ acted as both Band Director (2002-2008) and Fine Arts Facilitator (2008-2017) for the Pasco School District where the PSD music programs and Pasco School District were recognized numerous times for being one of the “Best Communities” for support of music education in the United States as awarded by music industry and education partners NAMM and NAfME. Prior to his current assignment, Russ served as the Director of Bands in multiple school districts including Pasco High School, Bozeman High School in Bozeman, Montana, and Libby, Montana. Russ's ensembles have always been among the top groups in festivals and competitions throughout the northwest with three wind ensemble performances at the prestigious All-Northwest Music Educators Conferences. Russ served for eight years as the music arranger for a Drum Corps Internationals perennial finalist, The Blue Knights Drum and Bugle Corps from Denver, CO and has arranged for the Seattle Cascades, Spokane Thunder and the newly reformed Columbians Drum and Bugle Corps. Russ maintains an active schedule writing original works for concert band, jazz ensemble, and marching band along with a variety of commission projects for groups of all ages. Recent projects include “Fanfare to the Great Hall” for band, chorus and orchestra written to commemorate the grand opening of the new performing arts center at Ferris High School in 2014. “WINDOWS,” written for the Hanford High School Wind Ensemble to be premiered at the “Music for All” Festival in Indianapolis in March 2014. Russ’s “Cantabile” for orchestra was performed in Carnegie Hall in New York in 1997 and at the 2018 “Music For All” Orchestra America Festival, and his Sonata for Flute and Piano is currently being performed internationally. Russ has served on state and national committees with the WMEA, NAfME, and the NBA. His position with NAfME was on the National Innovations in Music Education Committee. Russ has been active as a clinician throughout the United States and Canada and currently resides in Pasco, Washington with his wife Loralee. In his current position at Hanford High School, Russ has the extreme pleasure of teaching with his son Chris Newbury who also appears as a performing drum set artist for Yamaha and Vic Firth Corporations. Chris is currently the drummer for MILONGA, a popular Latin band based in the Pacific Northwest and Black Dolly(BD), a band he formed that features his wife Wendy on vocals and NW musicians Frazer Wambeke(keyboard/vox), Eddie Ramirez (bass), and Luke Basile (guitar). In addition to MILONGA and BD, Chris also stays busy playing with a number of artists throughout the Northwest. Chris has been blessed to share the stage with artists such as Victor Wooten, Jeff Coffin, Ingrid Jensen, Derico Watson, Los Lobos, Ryan Montana, John Dover, the Spokane Jazz Orchestra, and many more. He also maintains a busy teaching schedule along with composing/arranging music for groups around the country. Chris endorses Remo Drumheads, Vic Firth Sticks and Mallets, and is a Regional Yamaha Drum Set artist. 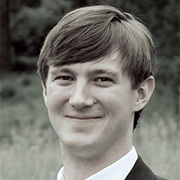 As a composer, Chris has experience writing for various groups in a variety of contexts. He has composed for numerous High School performing ensembles throughout the United States. He has written music for podcasts, bands, fashion shows, and much more. As an educator, Chris has overseen the Jazz and Orchestra programs at Hanford High School in Richland, WA for the past 5 years. He has helped establish Hanford High as one of the premier High School programs in the Northwest. Chris and his wife Wendy live in Pasco, WA with their daughter Nile and son Cairo and enjoy leading music at Columbia Community Church in Richland, WA. Adam Hancock joined the Hanford Instrumental team full-time in the fall of 2018 after working with the Hanford Marching Band off and on since 2007. Prior to 2018, he taught band and orchestra at Gonzaga Preparatory School in Spokane. Adam has crossed the Pacific Northwest and beyond as an instructor, arranger, choreographer, drill writer, consultant, and judge for a variety of marching bands, drum corps, and colorguards. Notably, Adam instructed the Troopers Drum and Bugle Corps from Casper, Wyoming and was the brass caption head at the Columbians Drum Corps here in the Tri-Cities. He has judged extensively in Washington and Idaho and consults for the Harrison High School Marching Band in Colorado Springs, Colorado, who were the Colorado State 3A Silver Medalists in 2017 and 2018. Adam received his undergraduate degree from Whitworth University in Spokane, where he studied with Dan Keberle and had the opportunity to share the stage with jazz greats Kenny Garrett, Robin Eubanks, and Terrance Blanchard. He holds a master’s degree in conducting from the American Band College of Sam Houston State University. As a performer, Adam was a member of the DCI World Champion Blue Devils Drum Corps from Concord, California as well as the WGI Open-Class Champion Rhapsody Winterguard from Seattle, Washington. Adam has also performed with the Spokane British Brass Band and the MasterClass Jazz Orchestra. He currently resides with his family in Pasco and looks forward to being a part of the Hanford team for many great years to come.